The Century Club recognizes dressage riders and horses whose combined ages total 100 years or more. Horse and rider perform a test of any level at a show (schooling or recognized) or event, and are scored by a dressage judge or professional. Western Dressage riders are also welcome to join the Century Club. An application (found under the "Join the Century Club" heading) should be completed and sent to the Foundation at least two weeks prior to the ride. The Dressage Foundation (TDF) will send a beautiful black and gold ribbon to be presented to the team at the show. Following the ride, TDF sends a Century Club plaque to the new team. 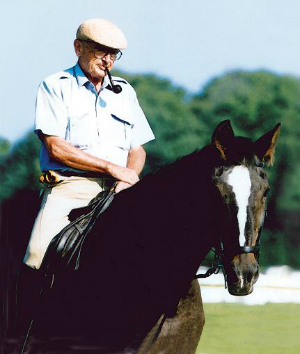 The Century Club was formed at The Dressage Foundation in 1996, at the suggestion of Max Gahwyler (CT), who with his horse Prinz Eugen, became team # 2 in the Century Club (pictured at the left). The first "Centurion Class" ride, held in 1996, featured Lazelle Knocke and her teammate Don Perignon. Lazelle's ride came after her extensive 'three year vacation' away from riding due to surgery and rehab time. As she said, "Hopefully the Centurion class will be in the forefront of a very interesting opportunity for Seniors and Dressage as Recreational and Therapeutic riding. It really is challenging and has long-term goals and benefits." The Century Club ride has evolved into a serious endeavor that encourages and rewards our older senior riders. The rider need not show everything at their level of ride, but it is important to show that rider and horse work well together. And while we stress the serious nature of riding a test, we want all senior riders for the Century Club to have fun! While this club has no dues, no meetings and no agenda, except to enjoy the occasion, many do keep in contact with the Foundation and with each other by email and phone. This is a wonderful group, not only experienced in horsemanship, but in various and unique life experiences. In order "to do good, we must do well," and we will welcome your financial support to help with expenses of the Century Club News, and the personal plaque and ribbon that we present to each Century Club member. Open to North American riders only. TDF's Century Club is sponsored by Platinum Performance. "At Platinum Performance horse health is our mission. Since 1996, we’ve been committed to providing high quality equine nutritional supplements that are developed, tested, and made with care to ensure results." Visit www.platinumperformance.com for more information.